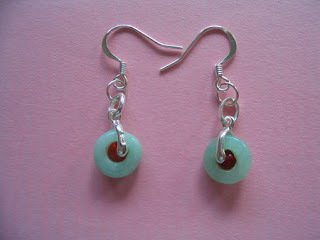 This tiny pair of earrings brings together my twin loves of jade and beads. I created this design by embedding red vintage glass beads into the heart of the vintage jade ring, the two held together with a silver clip. I love the flash of red glass lighting up the cool icy jade ring. I never wear earrings myself, and how I became a maker and seller of earrings is another story. Why I never wear earrings is simply because I have never gotten round to piercing my ears. Working with vintage jade can sometimes be frustrating because many of the standard findings will not fit into nooks and crannies of the old jade pieces.Making this particular pair gave me happiness as, bingo I quite fortuitously (learnt this word from reading Kundera) got everything to fit. I just hope that the earrings will be purchased by some sensitive soul sister and that it would beautify her ears and make her happy too.